Harry Porter has excited and dazzled audiences since the books, and subsequently the movies, came out. It revealed a magical world where everything was possible. Therefore, it’s fitting that there are LEGO toys that pay homage to the magical realm. The decision to purchase a LEGO Harry Porter building kit should not be taken lightly – most kits have thousands of pieces. So, we are here to help with some reviews and guidance, to help you find the best kit for your child. 2.0.1 What are the Different Types of LEGO Harry Potter? 2.0.2 What Age is Harry Potter LEGO Suitable For? 2.0.3 What are the Benefits of Building LEGO? Your first point of consideration is how large you want your building kit to be. If buying for a beginner, you should choose the least complex kit with the least amount of building blocks. Secondly, you should decide which theme you like. There are many themes including a Quidditch Match building kit and a Chamber of Secrets theme. Choose the theme that will be most fun for your child, perhaps based on their favorite characters, movie, book or scene. The age of the builder should also be considered as LEGOs may be swallowed by toddlers, so they are not recommended for younger children. 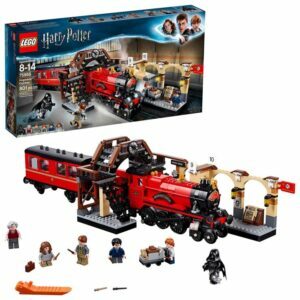 The Hogwarts Express is where the fun begins as you go off to the magic school – this Harry Potter LEGO train set is sure to be a lot of fun. You can set up platform 9 ¾ where students go to board the train. 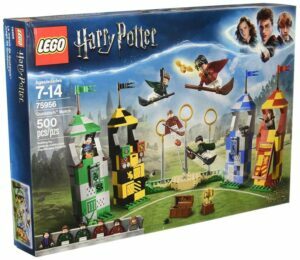 It is much more fun since the set comes with very colorful LEGO figures of Harry, Ron and Hermione. There are also additional figures namely Remus Lipin, Trolley the Witch (with a full trolley), a Dementor and Scabbers (Ron’s rat) to start you off on your magical escapade. The entire kit is brightly colored which makes assembly easy. The kit also has a train car with a removable side panel and a roof that can be lifted off. The kit includes stairs that allow the characters free movement. The best part of the set is that the train has easy access and other LEGOs can fit inside. So, kids can have hours of fun playing with this set after building it. 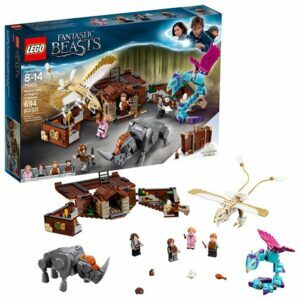 The Fantastic Beasts Newt’s Case of Magical Creatures LEGO kit is spectacular and comes with LEGOs of extraordinary creatures. The kit is particularly interesting because once fully assembled, it morphs into an incredible office and animal shelter. Inside the kit you will find miniature figures of Fantastic Beasts Queniee, Tina, Jacob and Newt. A niffler and bowtruckle are also components included in the set. The niffler has three pieces of gold for him to sniff and fool around with as the other figures play their roles. The Occamy and Thunderbird both have hinges on their wings which make it possible for you to assemble them in scary poses and even fly them around. The Erumpent has adjustable legs and head allowing for interesting poses including standing fiercely on his hind legs. There are unusual plants in Newt’s laboratory which the Thunderbird observes from up above. 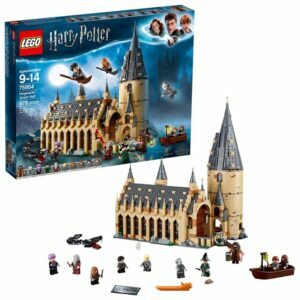 The LEGO Great Hall set has 878 LEGO bricks and includes ten figures, namely Harry, Ron Weasley, Hermione Granger, Draco Malfoy, Susan Bones, Professor McGonagall, Hagrid, Albus Dumbledore, Nearly Headless Nick and Professor Quirrell. Each character has his or her broom and wand. Hogwarts’ Great Hall is famous for its high roof and long tables where all your figures can sit. Students at the hall sit according to the house to which they belong. The Harry Potter Great Hall LEGO is accessorized with house banners, a movable spiral staircase and potion room. The set has a Sorting Hat to ensure you belong to a house be it Hufflepuff, Ravenclaw, Slytherin or Gryffindor. Also included is a tiny LEGO boat to help you navigate the Great Lake. Finally, other features found in the Great Hall kit are Hagrid’s pink umbrella, Dumblodore’s secret office and even the Mirror of Erised which has changing visions. 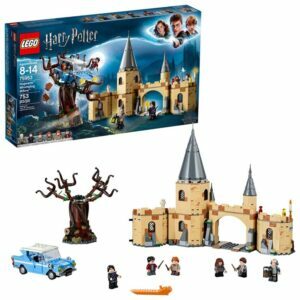 The Chamber of Secrets Whomping Willow LEGO set is a 753-brick kit that is an accompaniment to the Great Hall kit. It enables builders to recreate their favorite Chamber of Secrets scenarios. The characters that come along with the kit are Harry, Ron Weasley, Hermione Granger, Seamus Finnigan, Argus Filch, Severus Snape and Hedwig the owl. 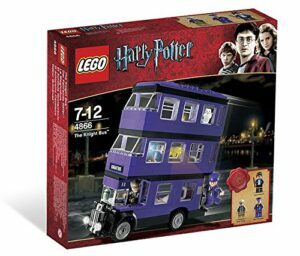 The LEGO set includes the Whomping Willow, the famous flying Ford Anglia, Ron & Harry’s dorm room and Professor Snape’s potions office. Another scenario that can be recreated with this LEGO kit is where Hermione sneaks into Professor Snape’s potions office and steals critical ingredients to make her Polyjuice potion. The Whomping Willow can be spun and cause the Ford Anglia’s trunk to fly open and throw Ron & Harry’s luggage out before disappearing into the Forbidden Forest. The complete Hogwarts castle is something to behold and the LEGOs version of the castle is just as impressive, only smaller. The castle contains everything including classrooms, the Great Hall towers, the Whomping Willow, Hagrid’s hut and 5 buildable boats. Perhaps the most impressive aspect of the LEGO Harry Potter Hogwarts castle is the number of characters it has included – 27 micro-figures to be precise. These include 5 Dementors, Aragog and Basilisk figures in addition to a buildable Hungarian Horntail figure. Moreover, there are four mini-figures which include Godric Gryffindor, Helga Hufflepuff, Salazar Slytherin and Rowena Ravenclaw. 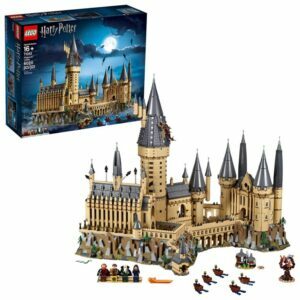 The LEGO Hogwarts set is one of the more comprehensive sets in the series and includes 6020 pieces, so good luck assembling this monster! The complexity of this LEGO set means that it is recommended for those over sixteen years of age. The Mini Diagon Alley Building Harry Potter LEGO set is one of the easier ones to put together. It only contains 374 pieces and uniquely contains only one minifigure, Mr. Garrick Ollivander. Mr. Garrick’s torso has a printing of a gray waist coat, brown scarf and jacket. The minifigure is also accessorized with a brown wand and has an impressive hairpiece. 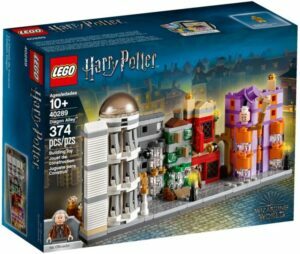 The LEGO Diagon Alley Building Set contains the Gringotts Wizarding Bank, a golden statue, Ollivander’s wand shop, Fluoris & Blotts bookstore, Quality Quidditch supplies and Weasley’s Wizard Wheezes. There are cobblestone tile pieces that function as the street and hold the structures together. Each building is intricately detailed and has its own color scheme. The set has a particularly architectural aspect to it and more so because you have to put together several buildings together and determine how well they fit into a street. The LEGO Quidditch set allows you to control every facet of the game. Playing Quidditch matches has to be one of the most prominent dreams of Potter fans and it is now possible. You can ride Harry into the air and do some impressive moves. There are four raised stadiums and each house is represented in the House Cup. Not only do you get to discover the secret portions of the house stadiums but you also get to know the unique functions of each house stand. All the figures included each have their own brooms and a mini LEGO shooter to shoot Beater balls. Did I mention there is a swinging stand with a LEGO figure at the top that functions as a keeper and protects all three goal hoops? Best of all is a red Quaffle in the Slytherin stand that causes Severus Snape’s robes to catch fire just like in the movie. The Harry Potter Knight Bus is based on the Prizoner of Azkaban installment. The three storey bus is amazingly simple to put together. The bus comes in three build sections that attach at the end. The LEGO set also comes with three minifigures. The first is of course Harry in his street clothes. The other mini-figure is of Stan Shunpike who is dressed in all purple and dons a conductor hat. This figure has a very detailed torso and also wrinkles on his cheeks, just like in the movie. The third mini-figure is of Ernie the driver. Ernie’s grey and wavy hair is unique to the LEGO character. The LEGO bus even includes the shrunken head that keeps cracking jokes and laughing in the movie. Every platform of the bus has unique features such as the chandelier in the top deck, Stan swinging from the back of the bus and Harry’s back seat. The fantastic LEGO Harry Potter minifigures set comes with 22 figures of all your favorite characters from every Potter story. The 22 figures comprise of 16 characters from the original series and 6 characters from Fantastic Beasts. All the main characters from each series are included and each figure has a small item with it that personifies and identifies the character. Some of the LEGO Fantastic Beasts included in the Harry Potter Minifigures set are Newt Scammander, the Occary and the Thunderbird. Additional characters included in the set are the Trolley Witch from the Hogwarts Express Train with her pumpkin pasties tray, Luna Lovegood with a copy of the Quibbler and Cedric Diggory with the Goblet of fire. 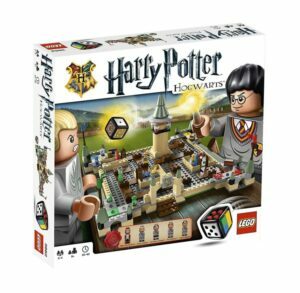 The Hogwarts LEGO Game contains 332 pieces but the game’s fun is not in its assembly. The game includes building instructions, a rule booklet and a single buildable LEGO die. The LEGO game’s characters are Harry, Ron, Hermione, Draco and Dumbledore. The game can be played by two to four people whose main aim is to visit classrooms, collect homework assignments and return to their house’s common room. A roll of the die means players can move a tile a turn. However, the game allows for some rolls of the die to shift and rotate tiles meaning the staircases are constantly shifting position. Players can even move through blocked pathways and duel if they find themselves on adjacent staircases. The game gets interesting due to the constantly shifting nature of pieces meaning progress is often stalled by walls and staircases that lead nowhere. Hagrid is one of the more beloved characters in the Potter series. The Hogwarts giant groundskeeper lives in a hut on the dark outskirts of the school. Many creatures surround the cabin including giant spiders and baby dragons. 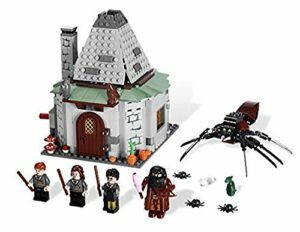 Hagrid’s hut LEGO kit includes 442 pieces. The rustic cabin has furnishings within it that include chairs, a table, pots and pans. The set also includes mushroom tops, katanas, owls, a fireplace, a fire brick, chairs and gray corner panels. The kit contains 6 minifigures, namely Harry, Ron Weasley, Hermione Granger, Rubeus Hagrid, Norbert and Aragog. The minifigures are quite generic and can be found in other kits excluding Hagrid. The LEGO hut exterior has some color variety with a green and grey roof plus brown doors. The interior is more colorful due to the wide variety of components. Assembling this kit will have an aura of mystery and magic. The LEGO Harry Porter Hogwarts Castle is the best for several reasons. The first is that it has over 6000 LEGO pieces to build, which provides a greater challenge to the assembler and requires more creativity. Secondly, it requires a person who really knows their Potter inside out! To assembly the entire Harry Potter LEGO castle, it significantly helps if you have read the books and seen the movies and will be able to appreciate and deepen your love of the Potter stories. The third reason why the Hogwarts Castle is one of the best Harry Potter Lego sets is because of its variety of mini-figures. What are the Different Types of LEGO Harry Potter? What Age is Harry Potter LEGO Suitable For? These LEGO sets have no definitive recommended age bracket. It can be said that as long as you like the series, you can buy and play with a themed LEGO set. There are some simple sets with 300 to 500 pieces that can be played by children as young as seven or eight years old. The sets in this range are likely to be too detailed and difficult for children younger than this. However, if they have experience building LEGOs and love the books or movies, kids a little younger might enjoy these sets with a bit of help to build them. What are the Benefits of Building LEGO? The most substantial benefit of building LEGOs is developing problem solving skills. LEGOs will teach anyone how things fit together, what shapes are compatible and how to combine different elements into one form. Building LEGOs is akin to being an architect. You have to start from nothing and figure out how different elements coexist. You will have to try different things and fail until it all comes together which can teach resilience and patience. There are countless benefits of building LEGOs.